"Mercure Banbury Whately Hall Hotel is a characterful 17th century 3-star hotel with beautifully manicured gardens to the rear and original features throughout. Discover the gorgeous oak-panelled Swift restaurant or relax in Horton's Bar for a drink or two, before retreating to one of the spacious en-suite bedrooms. This stunning Banbury hotel is ideal for business and leisure, with meeting and conference rooms capable of accommodating up to 120 guests. " 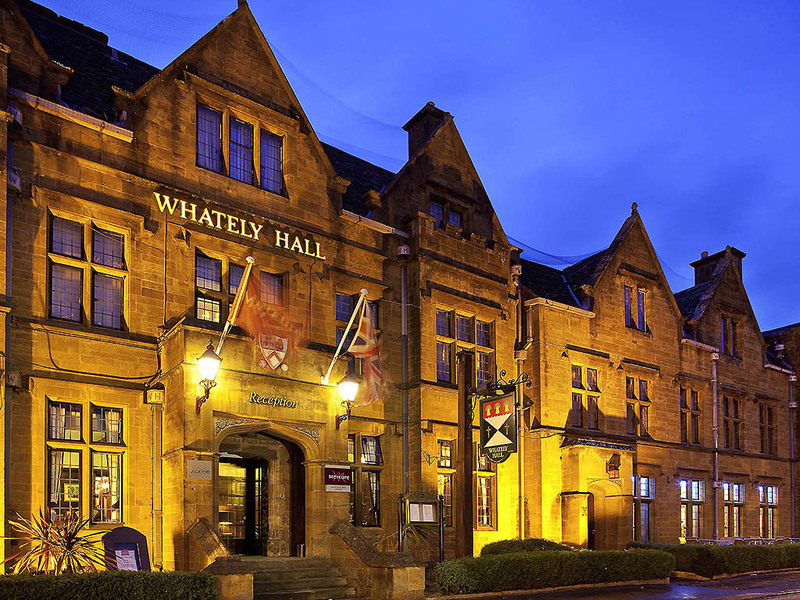 Mercure Whately Hall Hotel is a great base for visiting surrounding Oxfordshire, Blenheim Palace and the historic city of Oxford. Plus Warwick Castle and Stratford-upon-Avon, the birthplace of William Shakespeare is only 25 minutes away. The hotel's 69 bedrooms offer guests a range of accommodation options including privilege rooms, spacious suites, interconnecting rooms and enhanced accessibility. Each room features a range of facilities such as hair dryer and WiFi (charged). All bedrooms are in line with 3-star standards but some come with some of the original features of this 17th century building and breathtaking garden views. With a fine collection of artwork & prints the Berkeley Restaurant provides a intimate dining affair. Ideal for those special candlelit celebrations or family get-together, Whately Hall's Berkeley Restaurant will delight you with its charm. Overlooking the gardens, Whately Hall's Swift restaurant provides the perfect setting for any dining experience. Oak panelling; closed fireplace; iron chandeliers all work towards creating the most charming atmosphere in this 17th century hotel. Open fireplace, lead-lighting & oak panelled walls give the bar a rustic feel. Relax in the comfortable lounges & armchairs while enjoying something delicious from our snack/bar menu. It also provides the perfect hideaway to enjoy a quiet drink!